Today is a big day for us. 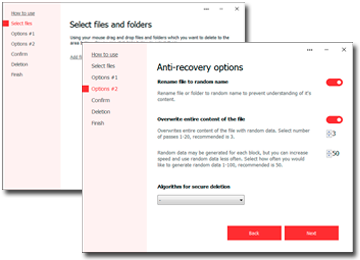 We're introducing to you completely new release of our program: Secure File Deleter version 6. And yes, this is version 6, but we say the program is new because there are a lot of changes! It looks nice, don't you think? 1. New look and style. Yes, the program got new interface, however, all features of the previous version remains inside. 2. Programming codes were re-written, its a new program from scratch. 3. Interface was made in wizard style, it's now more friendly for user. 4. We have added our own framework, which is common set of features for all our programs. In one word we can say - it's a new program. Please, give it a try.